JANE AUSTEN IS THE MOST INFLUENTIAL English novelist of all time, and yet each of us relates to her in our own private way. 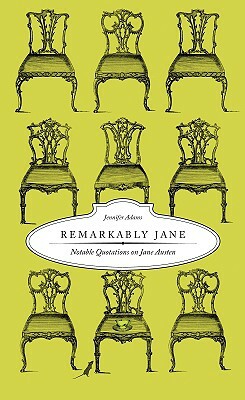 Remarkably Jane: Notable Quotations on Jane Austen presents one hundred of the most thoughtful, humorous, and impassioned quotations on the work of Jane Austen by great writers, actors, and intellectuals from the past and present. Together, these insights form a collective view of a beloved author whose talents remain unsurpassed. Jennifer Adams is a self-acknowledged Janeite and bibliophile. She works as a writer and editor in Salt Lake City. She is a member of the Jane Austen Society of North America. Remarkably Jane is her seventh book. Description: A brand new book in excellent condition - a 'must have' for all Jane Austen fans. "Insightful, pithy, and often illuminating, these quotations give you a glimpse into why Austen is considered by many to be the greatest writer in the English language, second only to Shakespeare."